Should have used turn-outs or bull pipes so roof doesn't get full of soot! Just say'in! Mine does, and so far have never seen one that didn't! 700 Series Brockways had the plus 3 also! 1979 R686ST in working clothes. Joe H, I grew-up not far from Chalfont in Holicong! Love what you're doing with your B Larry. I have similar issues with mine. I'm also interested in your 64 wagon. Tell me about your engine and maybe a few pictures. I have a 66 F100 with a 428 bored 30 over and except for crank all 427 internals heads, and valve train. Lots of fun! I don't know why the pictures loaded sideways. Anyone know where I can get a decent pair of doors for a N257 Brockway? That is correct, Royal Ahold. Giant of Carlisle runs the show and writes the checks! Giant Landover but both companies are owned by the same holding corp. 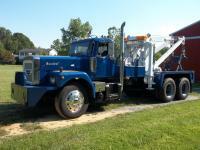 I drove a truck for Giant 35 years and this truck was our parade ready, completely rebuilt show piece. I have driven it in the past, 673 with unishift. Giant made many truck showpieces in their shop for their drivers and shop. Unfortunately the company was bought out by a holding corp. and sold off everything and chopped the company up and sold most of the assets. Sad end to a good company. I wanted to buy this truck but didn't have the money then(new child) . Wish I could have it now but the owner is asking to much! Hi Doug, I'm shocked your selling your C85, that is a beautiful truck. What ever your reason I wish you the best. If I had room I would love to have it because it's beautiful. My wife would like me to thin my herd a little but it's hard to part with them! Carlotpilot, I thought you had the MH rollback? I grew-up in a town close by and went to school in Doylestown. I also have a B61 very much like that one I tried to sell on here for $5000 that's alot better condition and runs good but no one was interested.I tried to upload pictures but it wouldn't work. It is an air-assist because you can still push the clutch in with no air built-up, but with more effort. It does have a unishift 10sp. When I get to restoring it, I will have to find another shift knob because the one on it doesn't work. I'm nor sure if I could just put a external air splitter on it like the eatons have. It will be awhile before I get to it because of other projects higher on the list. It runs buts has a bad piston(the guy I got it from was ether happy). I got the parts to fix it and another engine if need be. I'll try at some point here when I can. You can only see it from underneath. It is fairly complicated and looks not easy to repair if something goes wrong. It's one of my trucks waiting to be fixed-up and sitting in my barn, and is not on the top of my list to work on yet!